What Happens after Valium Rehab? Valium belongs to a class of drugs known as benzodiazepines -- ranking amongst some of the most commonly abused prescription drugs. Valium has a high risk for dependence and addiction, particularly when it is misused. In some cases, problematic valium use may require comprehensive detox and treatment through a rehabilitation program. For many people suffering from a drug addiction, entering a drug treatment program or rehab program is an effective way to detox safely and get clean. Unfortunately, relapse rates are high for most substance addictions, and staying abstinent after leaving a treatment program is a major concern for many patients. Aftercare is one way to help avoid relapse. Aftercare, sometimes known as continuing care, is a form of ongoing treatment after leaving a rehab program. Attending regularly scheduled therapy and counseling sessions. Entering a sober living arrangement for a while. Taking medications (at your doctor's recommendation) to help with cravings and withdrawal symptoms. Cognitive behavioral therapy (CBT) is among the most common interventions for benzodiazepine addiction, especially during withdrawal, but it can also be used as a tool to help with long-term management of rebound symptoms, such as insomnia. Some medications--such as the GABA receptor antagonist flumazenil--have been used to help manage troublesome acute withdrawal symptoms as a means of guiding patients through detoxification. Some research also indicates that the drug may be useful in the future for managing the more long-term, or protracted withdrawal symptoms. One or two case studies have also indicated that the anti-seizure medication lamotrigine may be useful for long-term prevention of relapse in people addicted to benzodiazepines, although much more research is necessary on this front. As with any drug addiction, the biggest concern following a treatment program is the risk of relapse. Continuing care, or aftercare, is one way to stay clean post-rehab. For more information on what to expect after rehabilitation, call 1-888-993-3112Who Answers? - speak to a member of our treatment support team about programs that incorporate aftercare planning. There is a 50% chance of relapse following drug detox. NIDA In general, drug addiction has a high rate of relapse--often more than 50%, according to the National Institute on Drug Abuse (NIDA)--although the specific rate of relapse for Valium is unclear due to limited research in the area. According to a National Survey on Drug Use and Health, 376,000 people aged 12 and over received treatment for dependence on benzodiazepines (the class of drugs that Valium belongs to) in 2013. Studies have shown varying relapse rates, with some lower than 10% and some greater than 50%. In one of the few studies on the predictive value of craving in benzodiazepine relapse, researchers discovered that high craving scores were significantly related to relapse after prior successful tapering off of the benzodiazepine. Other issues the drug was originally prescribed to treat. These issues can become severe enough to drive the user back to the drug, even after undergoing detoxification. Coping with these and other withdrawal symptoms and managing cravings is, therefore, a major focus for people managing their Valium addiction post-detox. Other psychiatric effects associated with discontinuation of benzodiazepines. Several meta-analyses have shown that cognitive behavioral therapy helps improve success rates of detoxification, and some research has also indicated that therapy is helpful as a long-term care option as well. chronic illnesses, including diabetes, hypertension, and asthma. Given the high rates of relapse for substance addiction, including Valium addiction, treatment programs should focus on giving patients the resources they need to undergo a healthy, drug-free recovery, and aftercare should be considered as a means of maintaining abstinence in the long term. Continuing care can encompass a wide variety of programs, therapies, and interventions designed to help recovering addicts manage their addictions. Community living or other "step-down" living accommodations. Medications designed to reduce cravings. 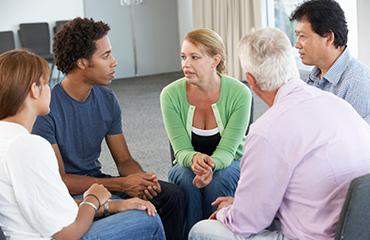 Patients who seek continued counseling after leaving rehab may opt for either individual therapy sessions or group therapy. Feel a sense of understanding and companionship because others are also going through a similar experience. Roleplay, which harnesses the power of social modeling to encourage behavior change. Build social support networks that can be accessed well into recovery. A general advantage of group therapy over individual therapy is cost. Counseling is one of the most common interventions when it comes to benzodiazepine addiction, with a particular emphasis on cognitive behavioral therapy (CBT). The goal of cognitive-behavioral therapy is to help patients change the motivations and behaviors behind the problems in their lives. It can be a useful way for patients to manage the mental health problems that may arise after discontinuing their Valium use. Given the high rates of co-occurring depression in Valium-dependent individuals, group CBT is reported to be highly effective as a treatment for treating comorbid depression and addiction. Changing compulsive thinking and behaviors. Motivating further progress in recovery. Engaging underlying panic and anxiety which may have contributed to the drug dependence. Many drug treatment centers and addiction support groups use the 12-step philosophy toward addiction. This popular philosophy presents a series of 12 steps intended to help participants acknowledge their condition and the harm it's causing in their life and the lives of others, while using spirituality and acceptance as tools to help manage it. Emphasizes the existence of a higher power. Recognizes the importance of wellness in mind, body, and spirit when it comes to recovery. There is research evidence in support for a beneficial relationship between spirituality and recovery from addiction, with abstinence being the most common treatment outcome in multiple studies. 12-step programs may not work for everyone, but don't worry, there are other options available.In general, it may be safest to conclude that the program works better for some people than for others, and that its efficacy may have more to do with the patient's overall philosophy toward addiction and recovery rather than the substance he or she is addicted to. People recovering from Valium addiction may find it useful to consult with an addiction expert and sit in on a few support group meetings that use the 12-step approach in order to evaluate whether 12-step treatment is likely to suit them, or whether a different philosophy on addiction would be more suitable. Some types of substance addictions are commonly treated with medications to help manage cravings. Currently, there are no universally accepted long-term medical treatments to help patients manage benzodiazepine addiction, although medications such as flumazenil are sometimes used to help patients through the detoxification process. However, there are some limited studies suggesting more research should be conducted on the effectiveness of certain medications, including flumazenil and lamotrigine, at managing benzodiazepine addictions. Carbamazepine (Tegretol (R)) has been reported in studies to have potential value in the treatment of Valium dependence, particularly in tapering an individual off of Valium and has showed improved drug-abstinence rates. Therapeutic communities or sober living houses--sometimes referred to as halfway houses--are a way for people to gradually transition back into their daily lives following a treatment program. These are community living arrangements generally designed for patients who are leaving a rehabilitation center or inpatient treatment program. Some studies have indicated that they are effective at reducing relapse rates for certain substance addictions, such as opioid addictions, however, there is limited research in their effectiveness for Valium users. Because of this, the research indicates that sober living houses should not be relied on as a sole means of aftercare for people experiencing intense difficulties in managing their addiction after rehabilitation is completed. Contingency management is a type of therapy that rewards "good behavior"--usually abstinence, which can be proven with a drug-free urine test--with items such as vouchers or prizes. While research has shown that contingency management can be effective, some studies indicate that there may be limitations to its effectiveness, namely that its effects tend to weaken once therapists attempt to wean patients off the reward system. That said, some research has found positive results for the efficacy of CM in reducing benzodiazepine use amongst patients on methadone maintenance for comorbid heroin and benzodiazepine addiction. Further, in a review of several studies, contingency management has been shown to improve abstinence outcomes, medication compliance, medical and psychiatric conditions. Find a Meeting There are hundreds of meetings held throughout the US. Find one today. Research has shown that strong social support networks can play an important role in lowering the risk of relapse for people struggling with addiction. Facilitating better understanding and communication. Helping families develop healthy ways to cope with their loved one's addiction. Help their loved ones make social connections with people who are going through similar situations. 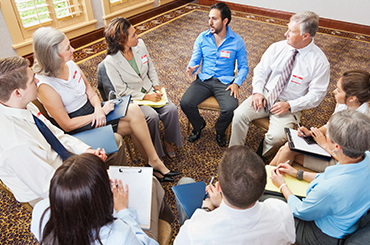 Give them a chance to speak in a group setting about their experiences. Help them develop ways to cope while learning strategies to better support their loved ones. If you're interested in more information on supporting a loved one who is suffering from a Valium addiction, call 1-888-993-3112Who Answers? to speak to a member of our treatment support team. Denis, C., et al. (2006). Pharmacological Interventions for Benzodiazepine Mono-Dependence Management in Outpatient Settings. Cochrane Database Syst Rev (3): CD005194. Hood, S.D. et al. (2014). Benzodiazepine Dependence and Its Treatment with Low-Dose Flumazenil. Bri J Clin Pharamacol 77(2): 85-94. Mol, A.J., et al. (2007). The Role of Craving in Relapse After Discontinuation of Long-Term Benzodiazepine Use. J Clin Psychiatry 68(12): 1894-900. Pavlovic, Z.M. (2010). Long-Term Treatment and Relapse Prevention of Alcohol and Benzodiazepine Dependence with Lamotrigine. J Neuropsychiatry Clin Neurosci 22(2):E25-6. Polcin, D.L., et al. (2010). What Did We Learn from Our Study on Sober Living Houses and Where Do We Go from Here? J Psychoactive Drugs 42(4): 425-433. Stitzer, M., and Petry, N. (2006). Contingency Management for Treatment of Substance Abuse. Annu Rev Clin Psychol 2: 411-34. Strobbe, S. et al. (2013). Spiritual Awakening Predicts Improved Drinking Outcomes in a Polish Treatment Sample. Journal of Addictions Nursing 24(4): 209-216. Walton-Moss, B., et al. (2013). Relationship of Spirituality or Religion to Recovery from Substance Abuse. Journal of Addictions Nursing 24(4): 217-226.